Kokusai Street has always been the heart of downtown Naha, and today that heartbeat is getting stronger. The popular tourist shopping district‹also a favorite with many locals‹is undergoing a transformation that now includes traffic-free Sundays. From Palette Kumoji on the street¹s southern end, to Makishi Monorail Station to the north, only special shuttle buses and pedicabs are permitted noon~6pm each Sunday. with the small shuttle buses plying Kokusai Street delivering passengers to the bus stops at both ends of the street. More than traffic, the Association is working to make visiting Kokusai Street exciting. There are now ten locations along the strip reserved for street performers, mostly at major intersections. Anyone with talent‹or who thinks he/she has some‹can sign up at the Kokusai Street Transit Mall Association office on the 3rd floor of Tembus Hall, across the street from Mitsukoshi. Last weekend there were jugglers, a fire-eater, a couple bands, magicians, a dance group, a contortionist and several clowns and pantomime performers entertaining. 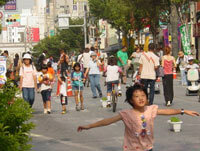 Kokusai Street is family friendly, with children even encouraged to draw pictures on sidewalks. Tables are set along the strip to let people sit and relax alongside sales stalls set up outside shops selling everything from tee shirts to beverages. More than 36,000 pedestrians were on the strip last Sunday, and officials predict those numbers will grow as the word gets out. 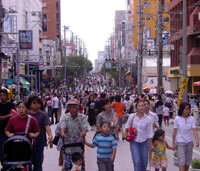 Since the postwar years, Kokusaidori has been the hub of Okinawa¹s shopping district. Named after the Kokusai Theater, now long only a memory, the street is home to department stores, shopping outlets, eateries and popular coffee shops. Since it¹s construction in 1953, when it was dubbed “the miracle mile” for its fresh look, Kokusai has been the setting for literally thousands of public events and festivals staged for millions of visitors. It is a treasure trove for even the most inveterate shopper. For the more traditional shopper, Kokusai is home to three major department stores. Ryubo is a nine-story shopping extravaganza, with a supermarket in the basement and five floors of men¹s and women¹s designer clothes and accessories. Three floors are filled with books, housewares and gift items. Atop it all, a nine floor featuring a variety of restaurants to relax after intense shopping. Mitsukoshi Department Store is in the midst of the 1.6 kilometer strip. Traditional styles from Coach, Tiffany and Guchi headline the shelves, while upper floors offer brand name clothes and accessories for the entire family. European gifts and house wares are also available. Of course, Mitsukoshi also has a bevy of restaurants on the top floor to provide the all-important shopping break. OPA is nominally a department store, although its 50 stores are independent merchants working together to give you plenty of opportunities to find exactly what you¹re looking for. OPA also has a record and CD¹s store, and a pair of discos pulsating with the latest sounds. A stroll up or down the length of Kokusai is always a pleasant experience. It is not, however, a place for quick shopping. There is simply too much to see and do. Starting from Palette Kumoji, where Ryubo sits, a walk north brings visitors to Chanja, an old Quonset hut next to an Okinawaya store on the left side. Chaja, open daily noon~2am, serves Okinawan food and cold Orion beer. Fuutan is on the left, specializing in awamori and Okianwan food. 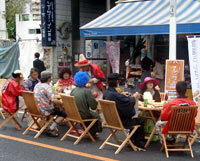 Yotsudake is open 11am~10pm every day, and serves Okinawan food and offers Okinawa dance shows. An Indian restaurant, Nanak, is on the right. Across the street is the Italian Tomato and Fish Pool. A few meters farther along and you¹ll run into cattle country. Steak House Hawaii is on the right, while Sam¹s Anchor Inn, Sam¹s Maui, and Captain¹s Table are on the left as you walk toward Mitsukoshi. Steam House 88 is directly across from the department store. Other restaurants along Kokusai are Blue Seal Ice Cream Parlor, McDonalds and Lotteria. Helios Draft Beer Pub is on the left, next to the new JAL City Hotel. And, of course, there are dozens of Izakayas and bars that open after 5pm. Walk around the corner in Izumizaki and along the canal, and you¹ll find even more. And those American names for coffee have found their way to Okinawa as well. Starbucks is located midway down Kokusai, its outdoor tables make people-watching a breeze. By taxi or car, drive south on Highway 58 from the military bases. As you enter downtown Naha, you have several options. Your first option is to turn left at Maejima, just south of Tomari [Tomarin Hotel on your right], at the intersection of the Roynet Hotel. This brings you to the north end of Kokusai street. A second option is to go to Kumoji intersection, about one-half kilometer further into Naha. The intersection has a Hot Spar convenience store on the left corner. Turn left and travel two blocks, under the monorail line. Ryubo Department Store is on your right. Kokusai is on the left. There¹s underground parking available near Ryubo.